Happy Shivaratri everybody! As music lovers, our worship is music, our prayer is music and our blessing is music, is it not? And so here I am, offering a song of the Dancing Lord in worship and in prayer, praying that I shall evermore have the blessing of a heart fulfilled by music. Cosmic Microwave Map, can you spot the S and H? There was something else which sparked my interest. The model which I had read before said that the universe was expanding like a balloon, but that the rate of expansion reduces as time passes. I had imagined that it would then attain some kind of stability. Instead, I understand (and I may be well have misunderstood!) that the expansion is in fact accelerating, and that the model that emerges is that of a universe which will expand faster and faster until it collapses into itself to become what it was before the Big Bang. And then perhaps it would start a new cycle again? Is that the cycle of destruction and creation which we ascribe to Lord Shiva? I must read up a bit more on this subject…. To remember Lord Shiva’s dance today, I have chosen a lovely song composed by Neelakanta Sivan in the raga Purvikalyani. I listened to many a rendition but this week, I couldn’t get past the old timers.. So first up is K.V.Narayanaswamy with a gorgeous rendition below. For a slightly longer version with an alapanai, here are the Hyderabad Brothers. I do like their singing, I should listen to them more often! *Note : தானந்தம் is pronounced as tAnandam by most singers, however as it is derived from Sanskrit word अन्त meaning end, the correct pronunciation would be tAnatam in my humble opinion. The Lord (implied) will dance (ADuvAr) his Dance of Ecstacy (Ananda naTam) in the (tannil) temple (ambalam, normally hall or court) in Chidambaram (tillai) where, for those who worship (paNibavarkku) at His feet (aDi), there is no defeat (apajayam). With light (jyOti) flashing brilliantly (paLIr paLIr ena) from the crescent moon (pAdi = half, madi = moon), the sound (oli) of ankle-bells (silambu) on his feet (pAda) ringing sharply (galIr galIr ena), His (implied) blue-hued (nIla) throat (kanTam) which swallowed (uNDa) the primeval/ancient (Adi) impurity (kaRai) glittering (minna) (reference: Shiva drinking poison from the churning of the ocean). ‘O Auspicious One (shankara)!! O Benign One (shiva)!! O Destroyer (hara)!! (Not sure what harapura indicates here…) O Beautiful One (sundara)! O Benevolent One (aruL vara)! O Ultimate (vara) Preceptor (guru)!! Thus do (implied) all eight directions (eNdisaiyum) sing (pADiDa) His praise (pugazh) while the whole globe (piNDam) and universe (aNDam) dance (ADiDa). Let us take our minds to the scene from Ramayana where Rama is summoned to his father’s presence the day before his coronation. Kaikeyi has demanded the boons promised to her by Dasaratha; she wants her son Bharata to be coronated and Rama to be exiled. Dasaratha is devastated but obliged to keep his word. So says Kaikeyi to Rama, when Dasaratha finds it too difficult to utter the words. How shocked Rama would have been to be exiled thus! Yet he takes it manfully, seeing it as his duty to fulfill his father’s words to Kaikeyi. 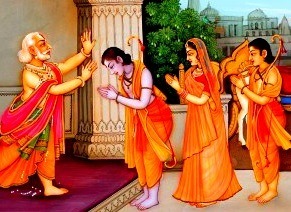 Bidding farewell to his mother Kausalya, Rama comes to inform Sita of his imminent departure. He bids her farewell, advising her of her duty towards Bharata, who is to be king in his stead, towards his father Dasaratha and his mothers. Sita, quite unlike herself, does not take this meekly. She is upset and demands to go to the forest with Rama, saying that the destiny of a wife is tied to her husband. Her words are strong; she says that she cannot be prevented from her intention. Rama explains to her the many discomforts, difficulties and dangers faced by forest dwellers. He speaks of dangerous animals, the lack of food, bed and comforts; he tells her of the rigours of the life of a hermit. Strong words indeed!! I was surprised when I read the word to word translation of this chapter; I had imagined Sita as a softer character, who goes quietly with whatever is demanded of her. Curious to see what Goswami Tulsidas writes in his Ramcharitmanas, I looked it up. In this, it is Kausalya who advices Rama that Sita is too gently brought up to survive the forest and she advices him to leave her behind. Sita is described as अति सुकुमारी , exceedingly delicate; as being timid चित्रलिख कपि देखि डेराती – frightened even to see a picture of a monkey. Rama then dissuades Sita by demonstrating her unfitness for the forest in many ways. Can a swan brought up in the nectarean water of the Manasa lake live in salt water of the ocean? Sita’s reply is much softer than in Valimiki’s dialogue. Her main argument is that a wife should be with her husband, and that she could not bear to be separated from him. You have mentioned many hardships and perils, woes and afflictions attendant in forest life; but all these put together will hardly compare with an iota of the pangs of separation from my Lord, O fountain of mercy! She offers herself in service of her Lord, she begs and pleads in her distress. I shall render all sorts of service to my beloved Lord and shall relieve him of all the toil occasioned by the journey. Tulsi’s Sita is more gentle but comes across as rather servile, calling herself a दासी or handmaiden. Arunachala Kavi’s (1711-1779) representation of her is more like what I had imagined her to be. 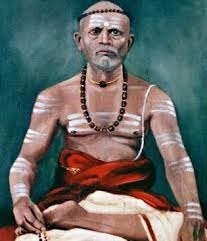 This great Tamil poet wrote the musical-drama called Rama Natakam which is based on the Ramayana. My song choice of today is set to the scene above. In contrast to Valmiki’s Sita who angrily demands her rights or Tulsi’s Sita pleadingly offering her services, Arunachala Kavi’s Sita is distressed but aware of her rights, as she reminds Rama of promises made. “How can you even bear the thought of leaving me?” she asks. She reminds him of his promise to never separate from her in any birth and asks if he is breaking his word to her. She speaks of her distress; “By distressing me again and again, you kill me without killing me with your words” she says. There is pathos in her pleas and it is well expressed in the Raga Huseni. I believe it was set to tune by Ariyakudi Ramanuja Iyengar. For lyrics and translation, see footnote. My favourite rendition is by Sanjay Subrahmanyan who is extraordinarily talented in showing bhava, expression, in his music. I have just listened to at least fifteen renditions and for me, none come close to the expression he portrays! I am a fan! I also like very much K.V.Narayanaswamy’s rendition which is beautifully enunciated. கரும்பு முறித்தாற் போலே சொல்லல்லாச்சுதோ ? ஒருக்காலும் பிரியேன் என்று சொன்ன சொல்லும் போச்சுதோ? karumbu muRittAR pOlE sollallAchchudO ? oru kAlum piriyEn enDRu sonna sollum pOchchudO? How (eppaDi) can your mind (manam) even bear the thought (tuNindadO; literally dare), O Lord (swAmi)? If you say (enDRAl: if so) that you will leave (pOy varugirEn) for the forest (vanam) (implied: without me), will the earth (bhUmi) bear it (ERkumO)? Did you not hold (toTTIrE: literally touch) my hand (kai) and say “I will never part with you (piriyEn), I will never leave you (viDEn) in any birth (eppaRappilum)”? (Refers perhaps to pANigraha ritual in a wedding). And yet (implied) you leave ((viTTIrE) this wretched (EzhaiyAna) Sita mid-stream (naTTATRil)? So there is to be (AchchudO) this harsh (karumbu muRittar pOlE: literally like a sugar cane being broken) proclamation (sollall) ? Are the words (sol) “I shall never (oru kAlum) separate from you (piriyEn) that you spoke (sonna) forgotten (pOchchudO: literally gone)? By distressing me again and again (varundi varundi), you kill me (kolla) without killing me (kollAmal) with your winning/subduing words (vella vArtayAl) O Lord (dEvarIr)! Have you become hard-hearted (irumbu=iron, manadu=mind, uNdAcchu=come into existence) enough to say (enDRu solla) that you will leave me behind (ennai viTTu pOgirEn)? When will I receive Lord Shiva’s grace? When will this wretched person’s grief cease? When there is wealth, all kith and kin come to praise and serve. When there is a reduction of wealth they do not speak even when they see us! When will I receive Lord Shiva’s grace to push away this wicked and villainous world and get liberation? Sycophancy : A self-seeking, servile flattery towards people of power or influence in order to win favour or for personal gain. I have recently returned from a very enjoyable holiday in India. As we were accompanied by some friends from Switzerland, I found it very interesting to see India and Indians through their eyes. My topic for the day is triggered by their observation about the excellent service we received at all the hotels we stayed at. Though their comment was positive, and true, I often noted an obsequiousness which was distasteful to me. This, of course, excludes public servants who were surly and apathetic as always. This servility in India is markedly different to one’s experience in other countries. In Western Europe, for example, for the most part one is treated with distant civility with the exception of taxi drivers in Paris who treat everyone with an equal level of insolence. In Australia one is treated with a rather familiar friendliness. In USA, it ranges from sullen indifference to pushy forwardness. It is only in India that have I seen this particular servility. If people are just simple and humble by nature, then it is of course praiseworthy. But this is not the case. The same service staff often display marked difference in manner when dealing with their colleagues. This servility is obviously in expectation of tips. In my song choice of today, Neelakanta Sivan condemns sycophancy towards the wealthy. I am however more sympathetic with it. When the tips that they hope to gain make so much of a difference, who can blame them? Is it not need which drives their behaviour? Should we not blame the disparity in society for their servility? If obsequiousness lets them survive, so be it. I tip them more than generously and hope that at least for that one day their life is easier to handle. Of course Neelakanta Sivan is not talking of service staff. He talks of parasitic relatives. ‘When we have wealth, many kith and kin will come to praise and serve us. When wealth reduces, they will not even speak to us’. Does he speak from personal experience? It seems he was in a position of power and wealth which he resigned subsequently. Click here to read a short article about him. He calls this world ‘wicked and villainous’ and wonders when he will be blessed by Lord Shiva to attain liberation. He is a bit harsh on the world, don’t you think? The song is lovely though. It is set to Raga Mukhari and its effect is sorrowful, devotional and introspective. To know more about this raga, click here. To present the song, I have first chosen a lovely rendition by a maestro from yesteryears K.V.Narayanaswamy (1923-2002). The song is often sung starting at the anupallavi, so do not be surprised. Another beautiful rendition is by the mellifluous sisters Ranjani-Gayatri. Mukhari is all about bhava or emotion and they bring that faultlessly into their performance. I am also very fond of the more leisurely rendition by T.M.Krishna in his CD Janaranjani. This is available on Spotify; needs free membership to listen. I have noted whatever alternate words that I have heard in various renditions. என்றைக்கு சிவ கிருபை வருமோ – ஏழை என் மன சஞ்சலம் அறுமோ ? When (enDraikku) will I receive (literally, will come varumO) Lord Shiva’s grace (krupai)? When will this wretched person’s (Ezai) grief (mana sanchalam) cease (aRumO)? When (pOdu) there is wealth (danam unDAna), all kith and kin (uramuRaiyOrgaL – short for for uravumuRaiyOrgal) come to praise and serve (konDADi-tonDADi). When there is a reduction of wealth (danam kuRaidAl) they do not speak (pEsAr) even when they see us (kanDAlum). (When will I receive Lord Shiva’s grace in order to) push away (taLLi) this abhorrent(kaittavamAna – unsure about this; kaittu is abhorrent, kaittavam I read in one translation as destined) wicked (polla) and villainous (chaNDALa) world (ulagam) and get liberation/moksha (nargati/sadgati chella-literally go to the ‘good destiny’) .